Each town in Chenango County is filled with history. 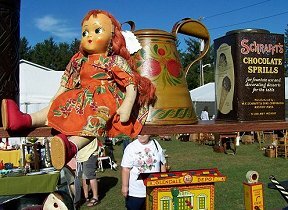 Not only are many of these quaint villages filled with buildings that are over a century old, but the historical treasures that can be found at antique stores and flea markets is also a part of the area's history. Each Memorial Day weekend for the last 33 years, it's been an antique car lovers dream at the annual Antique Auto Show and Flea Market held at the county fairgrounds in Norwich. Sponsored by Rolling Antiquers Old Car Club of Norwich, this show brings together hundreds of antique automobiles of all kinds. There are muscle cars, show cars, military vehicles, and foreign sports cards all in competition to see whose pride and joy is the best of the show. In addition to the cars, the antiques and collectibles are on display for sale and for auction. The fourth Saturday in July, Greater Greene Chamber of Commerce presents its annual Arts and Crafts Festival. 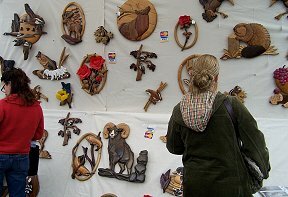 Better known as "The Craft Fair," this event has become the region's premier crafts show, hosting 200+ vendors of distinctive handmade crafts. You can find everything from fine jewelry, pottery, and inlaid wood artwork, to quilts and crystal. Greene closes off the town's entire center green and lines both sides with vendors' displays. Surrounding the green is a variety of local antique and collectible shops and restaurants. Shop the many displays and then flop down in a chair with a cool drink under a shady tree to examine your "finds."